College...if you think it's all about studying, you are so wrong. What's college really about? Falling in love...sometimes more than once. 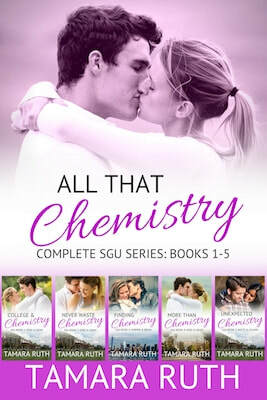 All That Chemistry contains the complete Smith and Guy University series following the adventures in romance of Edee, Harper, and Watzi. Happily ever after is worth it. Edee Davinroy's plans for her sophomore year at SGU: to focus ONLY on her studies. Then Adam walks into her life. Can love at first sight be real? Not according to Edee. But every time she sees Adam, she draws closer to what her heart wants. Harper expected a boring winter break until her mother announced they were off to New York. Updating her social media status results in an even better surprise: her secret crush asking to see her. But Christmas at the far end of Long Island turns out to have quite a few perks: namely Brian. Can Harper handle two guys? Edee's quiet Christmas at home imploded with the midnight arrival of her biggest frenemy. To make matters worse, she's off to meet Adam's family for New Year's. Romantic moments go a sideways when family gets involved. Plus Adam has a few surprises to share. Can they overcome the odds against them?